You may not be able to control whether or not your teen needs orthodontic treatment, but with today’s modern solutions, you can certainly choose to make it less bearable. 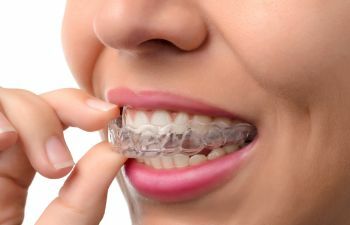 While most people are less than thrilled at the thought of getting metal braces, these unsightly brackets and wires can be especially unwelcome by a teenager. Adolescence is not only a time of gaining independence, but it is a stage in life when peer influence and social acceptance is heightened. Acne, awkward body shapes and changing voices are just a few of the obstacles that teens face when trying to feel confident or fit in. However, by choosing Invisalign Teen, their orthodontic treatment doesn’t have to be an addition to that list of struggles. With this modern clear aligner therapy, your teen can attain a straight and beautiful smile without the embarrassment, inconvenience and discomfort of metal braces. Go ahead and smile proudly for those yearbook photos because your Invisalign trays won’t be noticeable. No more hiding your smile as you pose for selfies with your friends either! With Invisalign, we don’t need to see you nearly as much as we would if you had traditional braces. Invisalign doesn’t require frequent tightening and adjustment appointments. We will check in with you every 4 to 6 weeks to monitor your progress. It can be difficult to say no to candy, popcorn and other foods that are restricted when you are wearing traditional braces as a teenager. With Invisalign Teen, you can easily remove your aligners while you indulge in your favorite snack or candy with your friends. Since Invisalign Teen allows you to remove your aligners to brush and floss each day, you’ll be able to stay on top of your oral hygiene during orthodontic treatment. Many teens in braces are faced with puffy gums (mild gingivitis) and unsightly tooth stains when their braces finally come off. The makers of Invisalign went above and beyond to make this orthodontic solution a perfect fit for a teenager’s lifestyle. In fact, they’ve added some extra features. In the teen version, there is a Blue Dot Wear Indicator that alerts teens and parents when the aligners need to be replaced. In addition, you’ll notice Eruption Tabs that allow space for your molars to come in if needed. Ready to learn if Invisalign Teen is right for your child? Call Georgia Orthodontics & Children’s Dentistry today.